Starting next fall, the college will have a new women’s res­i­dence on campus. The new dorm will allow Whitley Res­i­dence, which was ren­o­vated this past summer, to become a men’s dorm. In addition, the college plans to start ren­o­vating Gal­loway Res­i­dence next summer. These projects are a con­tin­u­ation of the college’s goal to update much of its housing, fol­lowing similar ren­o­va­tions in Simpson, McIntyre, Mauck, and Olds res­i­dences in recent years. The new dorm for sophomore, junior, and senior women will be three stories high, with 55 beds and double rooms. It will also have com­munity bath­rooms with cubby spaces and changing rooms, a com­munity lounge, a glassed-in study room with white­boards, and a study balcony, according to Asso­ciate Dean of Women Rebekah Dell. 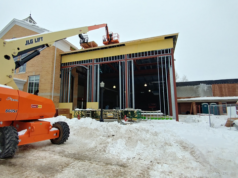 Its coffee house, which will likely have booth-style seating, will be open to anyone on campus. The fin­ished product will cost $3.2 million. The new dorm, still unnamed, will feature an outdoor patio, sit­uated between the dorm and the neigh­boring dorms, Benzing and Mauck. Dell said the patio could likely be used for musical events and other activ­ities, such as an open mic night. The new dorm will provide extra housing for many stu­dents who would oth­erwise have to live off-campus, according to Chief Admin­is­trative Officer Rich Péwé. 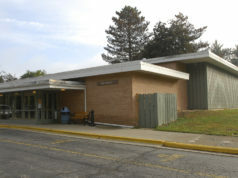 The Whitley ren­o­va­tions this summer cost $260,000, allowing for new blinds, windows, sinks, van­ities, and new wood, tile, and carpet flooring. 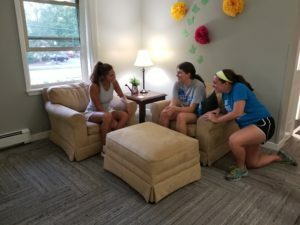 Ren­o­vators also painted the dorm in neutral grays and blues and refur­bished the kitchen with new coun­tertops and cabinets.The ren­o­va­tions began at the beginning of the summer and were com­pleted by mid-August. The Gal­loway ren­o­va­tions will be more extensive than those in Whitley. They will cost a total of $3.5 to $4 million and will be com­pleted by June of 2019, according to Péwé. In addition to new study spaces and lounges, the dorm will get new plumbing, air con­di­tioning, heating, lighting, elec­trical upgrades, dry wall, and bath­rooms. The floor plans will also change in order to make them more con­sistent with other recently-ren­o­vated dorms like Simpson, McIntyre, and Mauck. Dell said smaller projects like the Whitley ren­o­va­tions are handled by local con­tractors and the college’s main­te­nance facil­ities. For now, the women in Whitley are looking forward to enjoying their freshened space. Emily Rinaldi, a senior RA in Whitley, said she thinks her dorm’s ren­o­va­tions will bring the res­i­dents together. Previous articleAn alumna asks: What is the Hillsdale playlist?